Our focus was split today with a full team out on repair and clean up duty, and another hosting a Halloween Festival at Daffiin Park. 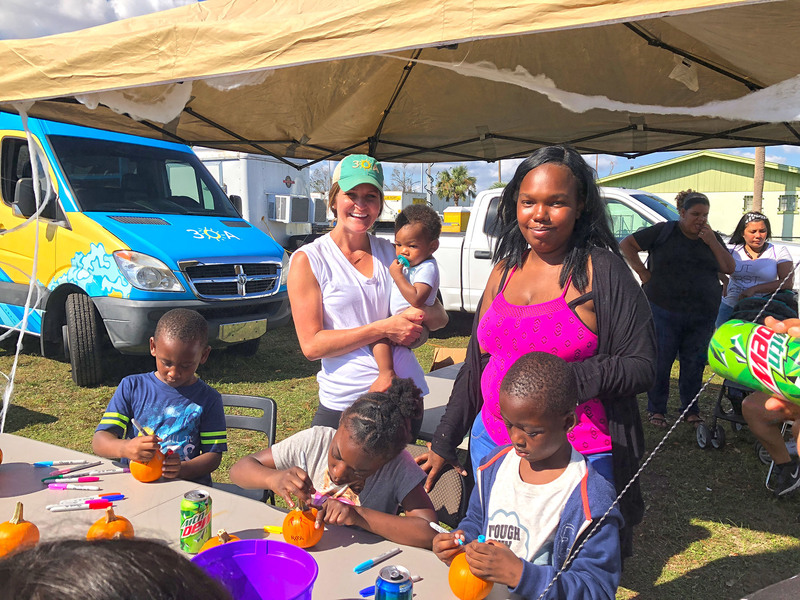 The repair team consisted of volunteers from 360 Blue, YOLO Board, and 30A along with a local physical therapist who signed up to take the trek with us. 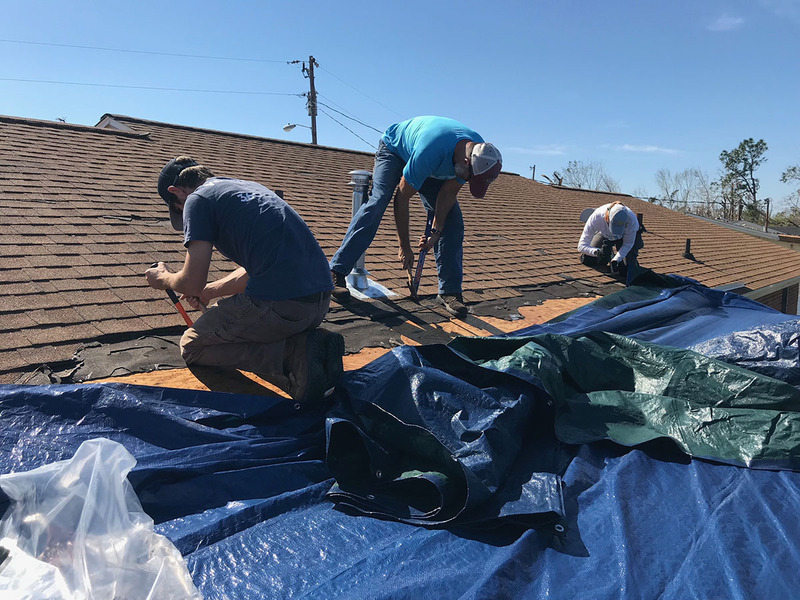 Also onboard were well-known local musicians Forrest Williams and Bryan Kennedy who got busy tarping roofs and cleaning up yards and streets of debris. Forrest had a bit of an issue with his work boot when the heel came off. He fixed it by using a roofing screw to hold it in place, job well done there, Forrest! At one house, an elderly couple told us that their vents were leaking. When we got up on the roof, we could see that something had pierced the roof in two places, something the residents could not see (or repair themselves) due to the steep pitch on their roof. 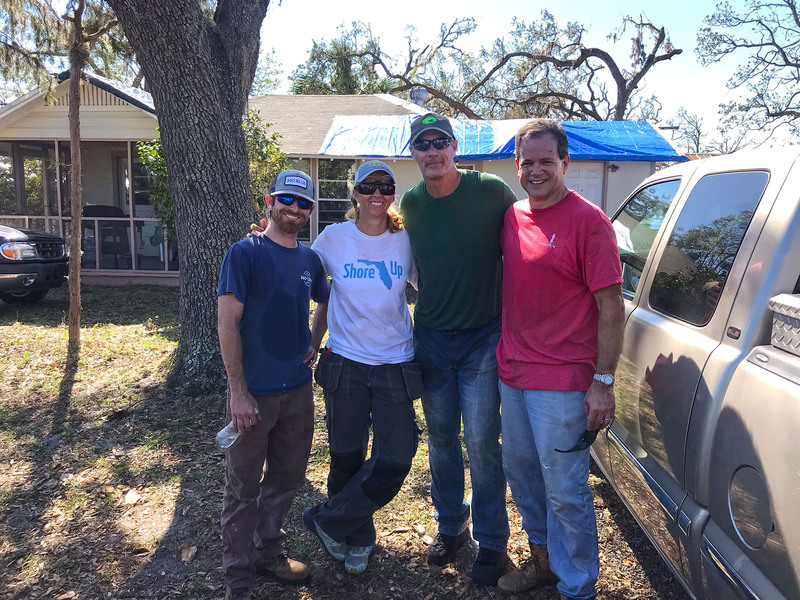 After the crew repaired the leak by securing a tarp on the home, we were presented with a plate of homemade cookies by the grateful owners. 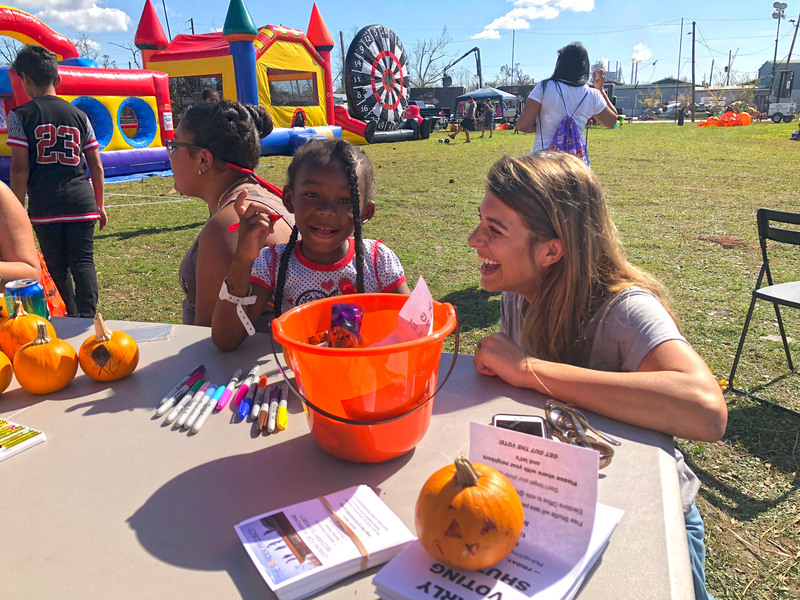 Meanwhile at Daffin Park, an afternoon of bouncy houses, pumpkin decorating, hot dogs and music filled the air. 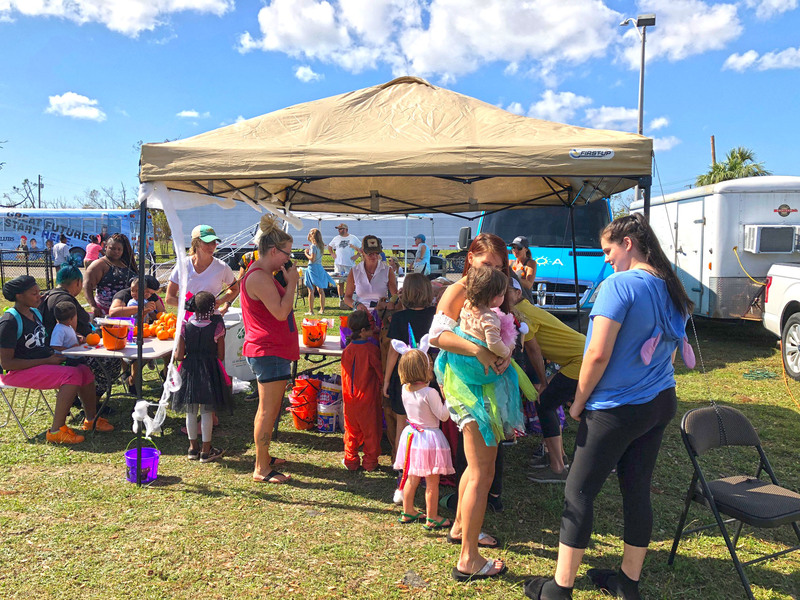 We had free candy and costumes for the kids donated by Butler Elementary School and even held a cake walk which was a big hit with adults and kids alike. 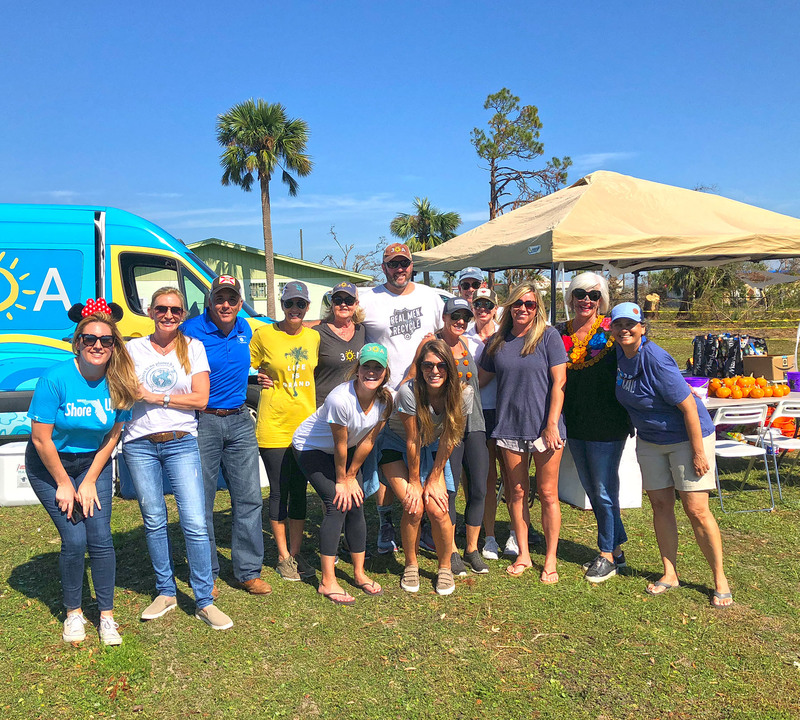 This team consisted of 30A and 360 Blue employees along with some local 30A residents and a woman from Flagstaff, Arizona who was here on vacation. She and her husband stay in the 30A area every year for a few weeks in October. She knew the need was there to help and spent a full day volunteering with us. She even painted her face to get into the Halloween spirit, much to the delight of the children. After 30A’s Megan Lyons encouraged a very shy young girl to enjoy some of the games and go into the bouncy house, the girl emerged bursting with smiles proclaiming, “THIS IS THE BEST TRICK OR TREATING EVER!” These small things, a little candy, some free entertainment, enabled kids to be kids when all around them is still broken trees and ongoing recovery.